Hiya, everybody! Happy Monday! Did you have your coffee yet? This little guy is brought to you in honor of every guy ever who cares about the zombie apocalypse, but especially my friend, Chris, whose birthday is TODAY. This very moment! Happy Birthday, buddy. 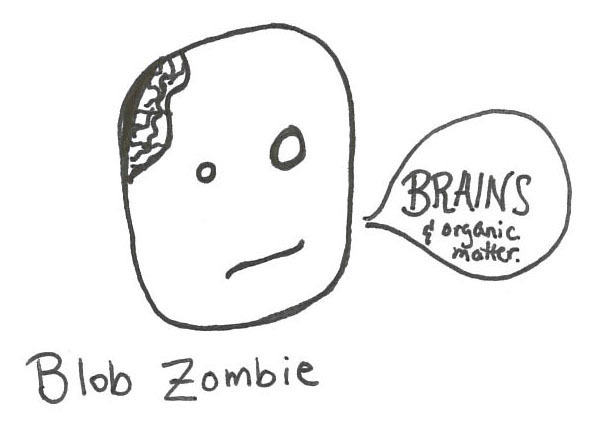 Additionally, I don’t necessarily believe in zombies, but if I did, I’d believe in the kind that don’t eat brains, but spread biological diseases, therefore causing “zombie-like symptoms.” This is the official position of We at the Blob Blog. And by we, I mean me. Enjoy your day, lovelies. Be kind to yourself and feed your own brain by learning something new! This entry was tagged Birthday, blob, boys, Halloween, Holiday, Rob Zombie, The Blob, Ween, Zombie, Zombie (fictional), zombie apocalypse, Zombie apocolypse. Bookmark the permalink.